I have decided to publish a private email to a old and dear friend, as an open letter to all women. My friend was and is struggling, and I swear I could feel it through the ether. Although we have not seen one another since before the birth (and conception even) of our second children (years ago! ), and have only seen each other a few times since we graduated from high school, we still remain very close. Having the instinctual urge that something was not right with her, I emailed to ask if I could fly her down for a weekend of rest and renewal. She immediately wrote back, obliged, and in the midst of our plans to visit one another, she shared the complexities of her life that led her up to this point of exhaustion (sound familiar ladies?). So ~ to all working mothers (who work at home or out of the home!) This letter is written for you. Mental telepathy or yogic energy or whatever we identify it as – friendship is important to me and I have just not been able to get you off my mind for MONTHS. The feeling would not leave me. So, yes, we need some intervention here. When I must face a challenge (personal or professional), the first thing I do is eliminate all distractions.In your case, this means getting mean and lean about what you eat, what activity you engage in, even who you hang out with and your everyday schedule. In case you are wondering where I am coming from – just go to my website. That is about the easiest way to see what I do on a daily basis. www.gingergarner.com. This is why I am a bit of a soapbox preacher about taking care of #1, especially for women. Women are the nurturers of society, the birth mothers of this planet. We need more respect from our peers, from men in the workplace, and greater understanding from husbands and partners. Women shoulder a greater burden than they ever have – they are expected to give birth and be mothers, keep their household in order, maintain a professional career, and provide moral support to our partner. We are expected to raise up the next generation AND be experts in career and household management – all the while staying in beautiful shape, without showing external signs of stress or anxiety, all the while being a rock solid shoulder for our partner to lean on to keep their personal (and sometimes professional) lives in order. However, after watching Angelina Jolie’s movie Changeling last night, I cannot help but climb onto my old worn out soap box. Women, we need to help each other in the workplace – both at home and outside the home. Rise up and fight the Good fight, as I will always say – because we need to be our biggest advocates. We have to be hard edged and lean as women (not necessarily physically) – and nurturing and soft at the same time. Set serious boundaries. Let your partner know exactly what you need, and expect him to help you achieve it. This person is your life partner, and you promised each other you would always be there to build each other up. At this point in your life, you MUST be built up – or the Fortress your family knows will begin to crumble. If you need 30 minutes a day, plus shower, prepping for better meals/meal planning – then ask for it. No apologies either. Women are in the habit of apologizing for asking for time for themselves. Don’t apologize. You need this to BE WELL. Carve out the time you’ll need to turn this Car around and arrive at the destination YOU want and need. Make an announcement to the family – to anyone you need to – that you are making some changes and you would like some autonomy, some respect, and some assistance in making those changes. Period. End of sentence. Purge food. No, not bulimia. Ha. I mean – get in your kitchen and throw out all the crap. Be ruthless and unforgiving. Any piece of, slice of, box of – whatever is processed, nutritionally devoid, etc – get rid of It. This does not mean all sugar, dark chocolate, butter, eggs, milk, yogurt, oil. Not that stuff – you need those things. I mean anything processed, non organic, or things which you know make you feel bad or sluggish. ( in the original email I asked her to please send me a list of foods you know “do not work” for you, or that you know make you feel sludgy, pudgy, or otherwise). Purge home/closet/etc. Get rid of anything that does not represent WHO you want to be and is not BEAUTIFUL or serves a real purpose in your life. You might need to enlist the help of someone there – because it is tough to purge your own house and closet of things that are no longer “you”. From this day forward – only bring things into your home that represent who you want to be and how you see yourself in the future. This means clothing, books, magazines, pictures, furniture, bedding, etc. Decide to take action – get mad if you have to. Darn it (or whatever expletive might work best for you) – I am NOT taking this _________ anymore. I am enacting change, and I am doing it TO.DAY. Once you get fired up enough – then you are ready and we can talk some more. You’ll know you are ready to commit to change. Know that it is not your fault. You have been in survival mode, probably for years now. It is not your fault that you feel stuck in a place you do not want to be – which includes your job, your weight, where you live, whatever it may be. Many circumstances can push us down the wrong road. But the tipping point is this: no matter what the circumstances you hold the power to enact RADICAL and MASSIVE change in your life. YOU CAN DO THIS! Urgency. I always act with a sense of urgency. No time is to be wasted. If you are lucky, you might have another ___ (fill in the blank for what fits your age) years on this planet. How many years can be wasted on not feeling the way you want to feel, or look? How many more years can be left to not being the Real You? Break it down further – and we only have another ___ (fill in the blank for what fits your age) years until we do slow down, priorities greatly change – and we will have spent up all our youth. This means truly – the best years of our lives are NOW. We have ____ (fill in the blank for what fits your age) years until we must give up the torch of youth to the next generation. You could be your absolute BEST – within this year. So, there are some thing for you to work on. I wish I were nearby and I’d come to your house and we’d spend a weekend doing nothing but purging, detoxifying, and rebuilding the structure of your daily life. This is where my motivation dwells – in helping others be their BEST Self. On a practical note I believe you would LOVE Yoga and Pilates. My life revolves, as much as my imperfect humanity allows, God, family, and yoga. No kidding. From those three – I can manage my body and mind. All of these things I say – are to make your life more simple. You do not need more things “to do” – you need less to do. This is going to mean a big purge of everything and everyone in your life that does make you come ALIVE. That was written for you. 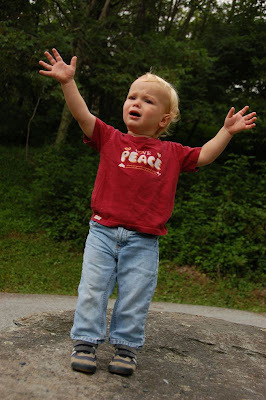 *picture is from last week’s blog, of my youngest son at 21 months. He preaches and teaches to me already. Thanks for this post. It makes me feel great and it motivates me further to take more actions to change my life positively. I remember starting off my marriage life in the role of a stereotypical wife that I myself believed was the only role for me. It made me withdrawn and gloomy. I realized I was alive but not living. My life went on boringly for years until I decided to quit my government job in 2004. Now, I'm almost totally changed. I'm mostly positive and always determined about doing something. I have also learnt to dream and work towards it. Thanks for your post. I feel energized all over again.